Photograph Giclee on Canvas | 39.5" x 59"
Photograph Giclee on Canvas | 59" x 39.5"
A picture is never simply clicked, it has to be made. I believe that framing, composition, perspective, angle and story should all be on the same page in order to produce a decently beautiful image. Looking at the world through a lens allows me to appreciate even the most mundane of activities. Photography provides me with a medium to digitally control the amount of light, texture, colour and to exercise my creative take on life. It is a very satisfying experience when I go through thousands of images and find that at least one image among the entire lot has turned out the way I had visualized it to be. I attempt to tell the lesser known story, to capture things in an uncommon fashion and to showcase the hidden beauty that a human eye might miss. 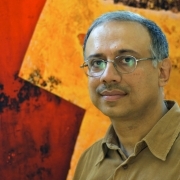 Sanjay Nanda is a graphic designer, photographer, gallerist and a digital print maker. He has worked at IndiPix Gallery and IndiPix Imaging, his vast experience and prominent presence in this diverse field of images and photography is clearly visible. His passion and perfection in capturing images at the precise moment is highly commendable. Sanjay Nanda's style can be termed as expressive minimalism. In other words, his photography technique focuses on bringing out the exact meaning while removing any unnecessary clutter. He draws parallelism with what he sees and what he interprets and communicates it while triggering emotional, intellectual and imaginative responses. His photographs are a rare combination of abstraction, incongruity and integrity. The clear images that are void of excess description and stripped down to the bare essence highlights his abstraction skills. Incongruity is brought about while he stimulates emotional and imaginative responses through paradoxical elements that seem to be at odds with each other. His photographs have a great deal of integrity that are conveyed through emotions, knowledge, beliefs and traditions.